The golden lion tamarin (Leontopithecus rosalia) is a brilliantly colored monkey species native to South America, particularly the coastal areas of southeastern Brazil. These red and orange New World monkeys reside up in trees for the most part, and they eat both animals and plants. 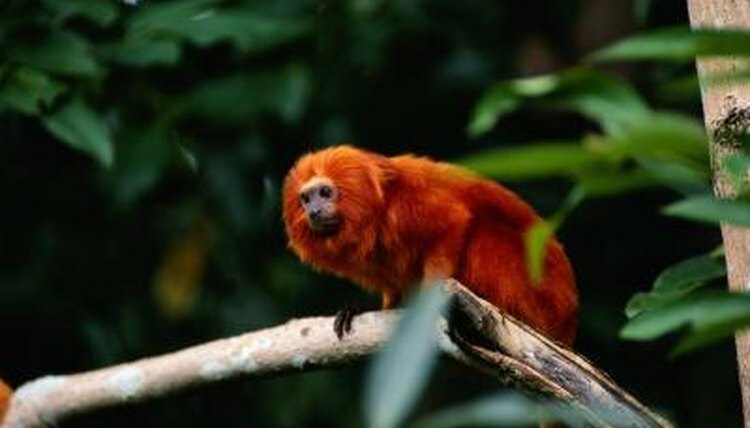 Golden lion tamarins are endangered, according to the International Union for Conservation of Nature's Red List of Threatened Species for 2008. Disruption of their natural habitat is one of the biggest reasons; much of their range has been deforested to establish plantations for sugar cane and coffee. Logging, poaching for hides, and livestock breeding also threaten these monkeys. Golden lion tamarins tend to inhabit damp and thick tropical forest environments. They are very close to squirrels in size, according to the Philadelphia Zoo. The key elements of the golden lion tamarin diet are flowers, soft fruits, nectar, snails, spiders, and bugs such as crickets. Golden lion tamarins occasionally eat small vertebrates. These include frogs, lizards, adult and baby birds, and bird eggs. Golden lion tamarins find insects to eat through a process called micromanipulation, according to Animal Diversity Web of the University of Michigan. With micromanipulation, these monkeys use their long, narrow fingers to explore fissures in tree bark. In this way they pull out a lot of hidden food. Golden lion tamarins who live in captivity eat slightly different foods than their wild counterparts do. Some typical foods for a captive golden lion tamarin are fresh vegetables and fruit, eggs, bugs, and especially commercial marmoset food. They get crickets, mealworms and waxworms for protein. Examples of the fresh produce they are fed are sweet potatoes, corn, peaches, carrots, plums, melons, bananas, green beans, grapes, apples and pears.